A trio of HMV stores earmarked for closure have been reopened this week, with more potential rescues on the horizon amid efforts from new owner Doug Putman to renegotiate rents with high street landlords. A source close to HMV has said that more stores which are currently shut “are up for grabs”, although the current number is unknown. HMV’s iconic Fopp Glasgow Byres and Bath stores have both resumed service after several days of being closed, and yesterday it emerged that one of the retailer’s flagship outlets in Bluewater also reopened its doors after the Canadian entrepreneur renegotiated the terms of the store’s lease. The chain’s Fopp Oxford store could also be reopened in the coming days, with HMV saying that the store is “opening soon” on its website. It is understood that Putman has also attempted to save the chain’s flagship store on Oxford Street, where the brand was initially founded almost a century ago, even though the outlet was trading at a loss. However, the London site was sub let from Footlocker, which is understood to be in talks with new retailers about occupying the space. Putman’s discussions with individual landlords to reduce rents comes a week after the owner of Sunrise Records stepped in to save 100 of the struggling high street chain’s stores. However, plans for 27 store closures were announced as part of the acquisition, and Putman told the BBC that the closures come after continued rent rises. “You can only lose so much money on those stores before you need to make a change. Unfortunately rents are just very high at this time,” he said. 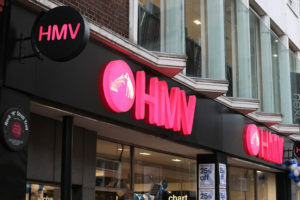 Prime locations such as the Trafford Centre in Manchester and the Bluewater in Kent are among the 27 HMV stores that have been closed as part of the takeover, as well as every London store apart from the retailer’s Fopp outlet in Covent Garden.